I spent a few minutes after lunch checking out our green conditions. Overall we are holding our own but do have a number of greens that are showing some significant stress, well all of them but some are definitely much healthier than others. We received very little rain yesterday .06" of an inch but the cloud cover did help hold green internal temperatures down into the low 80's which is great until the sun came out later. I'm sure we are well over 90 again this afternoon. I closed the course to all employees for tomorrow on our club closed day in an effort to give the greens complete relief from any activity except some potential watering that we might need to do to keep the turf as healthy as possible. We mowed on Saturday and rolled only on Sunday. The greens will receive at least two days of no mowing and our weakest greens listed below might be allowed to rest even longer if we see limited growth. We have a few more days of this near 100 degree heat with some days near average coming toward the weekend. 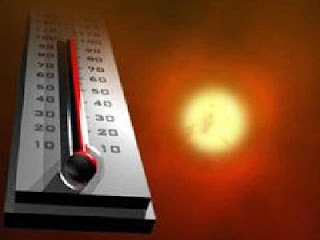 The month of July 2011 is shaping up to be the 4th warmest on record. At least 3 degrees warmer than last year and the warmest July since 1980 by almost one full degree. Eight days over 100, 2 at 99, 2 at 98, and 25 total days of at least 90 or better, 10 more than average. Below is a summary of some of our troubled greens. The practice green has good color but is stressed overall from the activity that it receives on a daily basis. 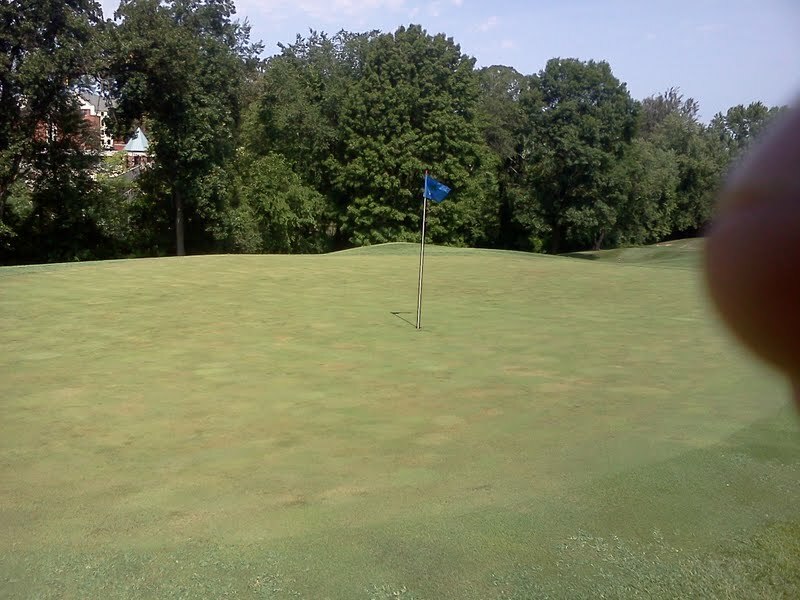 The surround turf is going dormant due to a lack of adequate irrigation since it is the only green that does not have a true green surround system. #2/3 are basically about equal in their level of stress. Both are located in the worst area of the golf course. Lack of air movement on both greens creates serious issues. #3 is probably in a more difficult environment because it receives sunlight almost all day until near sunset. #11 has shown marked improvement over 2/3 but is still struggling. #6 is beginning to suffer a little more than it has over the last few days. 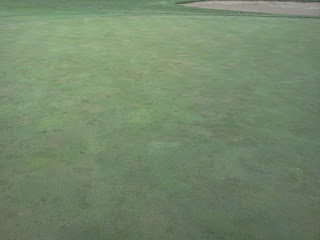 Air movement last week helped this green but it is beginning to show some stress but it is growing. The sod line where replaced turf last year on the right side has thinned significantly giving the appearance of a spray damage but it is the sod that is trying to check out. 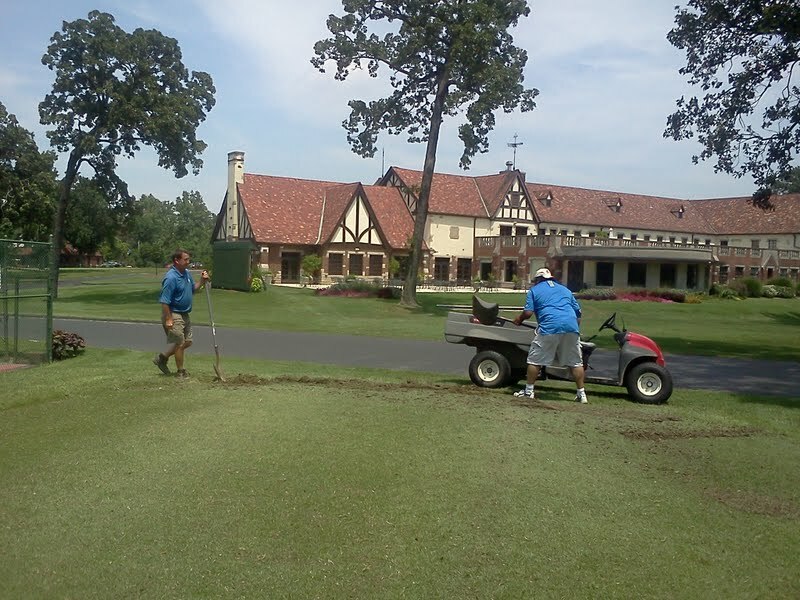 We will do some extra spiking this week in an attempt to rejuvenate the sod that is declining. #8 is doing okay but does has some significant stress in the front area of the green. #9 has been looking pretty well but is beginning to show some additional wear since earlier in the week. We will be placing our tractor mounted and cart towed blowing units near our worst greens for the next few days to give them some air movement which helps to keep the surface at a lower level. 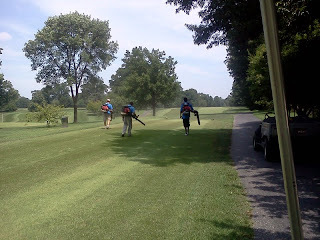 Fans and or air movement on the golf course allows the turf to respire which assists in the plant cooling itself. If the plant does not receive air movement, it closes itself off and begins to build internal heat like a human body which could lead to cell death and ultimately death to the plant just as a we would experience during a heat stoke or exhaustion event. There is a course in the area that has an infrared surface thermometer that they have utilized to check surface temperatures. In the area where a fan was assisting the green, the surface temperature was 92 degrees and the area away from the fan where it could not impact temperature, the surface was around 117 degrees. A marked difference. We will be moving these units every couple of hours to another green to aid in their recovery process. We appreciate your understanding as we continue to do all we can to protect our greens from this most stressful period. No damaged trees here is my opening salvo regarding the above title. On to my story. This spring I began to use a new herbicide called Imprellis. This is a new chemistry from Dupont that kills many broadleaf weeds both on contact and through the soil which to my knowledge is no other product on the market that is like it. It has a very low use rate of 3 oz per acre and is very safe for applicators to use. It is safe on all cool season grass, has some activity on zoysia but will flat knock the socks off of bermuda which interested me because of our need to rid the first cut of rough of bermuda. So I tried it in some areas, out in the open, away from trees. It worked well and it sure did knock the bermuda for a loop. Some just started to grow out of the damage just before the Invitational. No tree damage to report here. I wanted to mention this in case any of you had a lawn service apply this product and possibly lost a tree that should be investigated. As you will see in the reports below, it looks like a multi-million dollar loss and lawsuits to come. Well, we have come to find out on a large scale that there could be a problem with this chemical on Conifers. It appears that the material has been sprayed around or near trees and has had a deadly consequence. Here are a couple of links to news reports regarding this potential problem. I am cautiously optimistic regarding the overall health of our greens. We have seen some improvement over the last couple of days of greens that had weakened from 12 days of searing heat. As mentioned earlier, our collars have taken a severe beating on some greens. They do appear to have calmed some over the last day or two. I checked out a facility yesterday that had the same issues with their green collars. I'm hearing other facilities that have had severe loss of collar turf. It is very difficult for all of us right now. From what I can tell, there is some normal disease issues that we experience this time of year. Anthracnose being the major disease that is induced by stress and poor drainage. 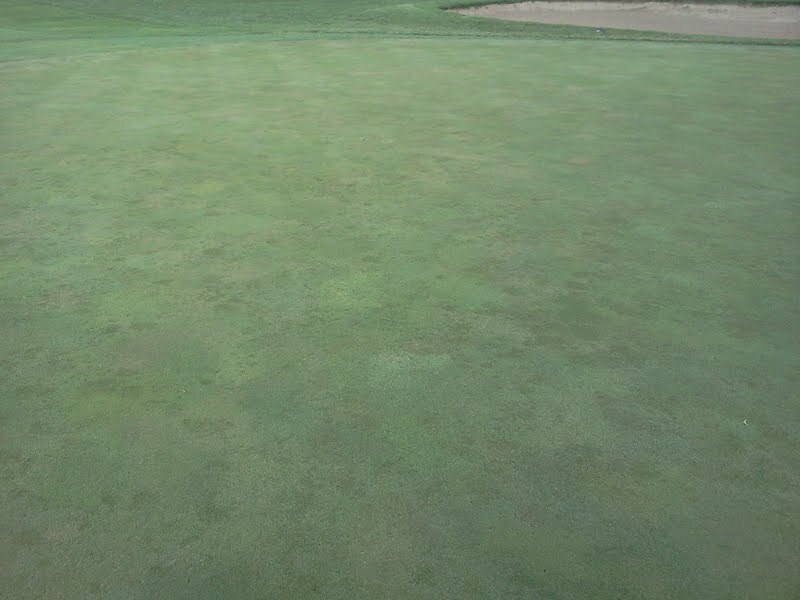 We are trying to combat this disease with keeping our green moist but not wet or saturated, fungicide applications that help reduce the severity of this disease and light amounts of fertilization that will help our turf grow out of this disease. We have not seen very much algae appear but if we get rain over the next couple of days, it could rear its ugly head. Raising of our green height will help reduce the impact of the algae because the canopy of the turf is slightly less open than if we were cutting at a shorter height. Our biggest fear is of a pathogen that will work under the turf canopy in the rooting area. We have treated for these type of diseases and will make another application tomorrow ahead of the potential rain that is being predicted. As of now, we are fully turfed but it will be interesting to see if that changes over the next few days as some of our weaker spots begin to heal or move the other direction and become sicker. As of today, we are 5 degrees above normal in temperature for July. Our night time temperature is almost 3 degrees more in comparison to last season. We have 7 days over 100 right now. We only had 4 days in total last season. 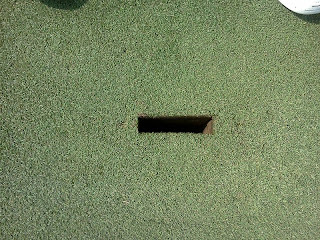 I've attached 3 sets of photos from 3 different greens in an attempt to show you what is lying underneath your feet as you play. Overall, our rooting appears to be at the 3-4" level which is really good at this time with some strands stretching into or near the push/soil level. #1 green from back to front. 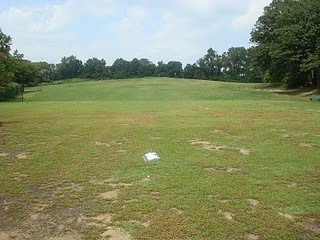 The area I sampled was from the middle right as you play into the green. As you can see from this sample, it appears to be off color. The sample I took was almost 6" deep and into the soil layer. As I pulled away sand you can see roots beginning to show in greater numbers at the 3-4" line of the tape. White, not brown from heat damage or lack of oxygen. Sample area from #7. Fairly healthy located in the middle back left of the green. Sample over 6" deep. 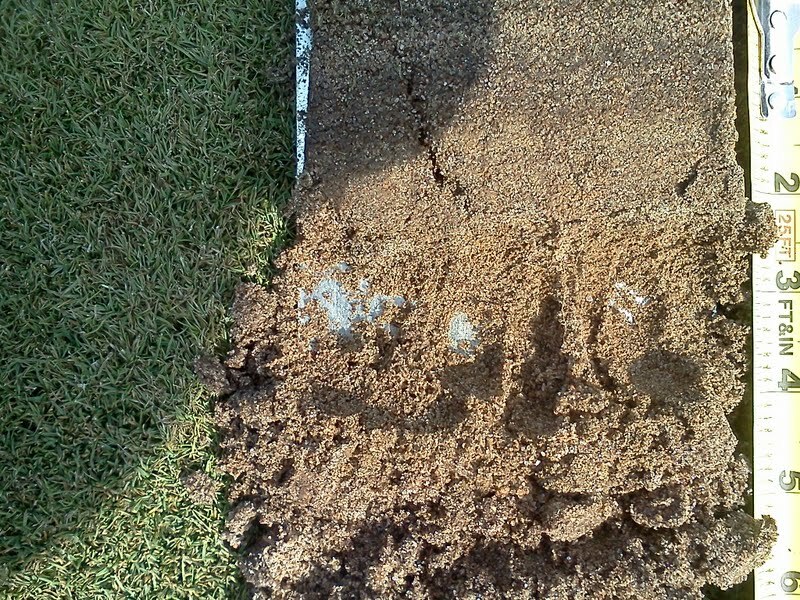 Look at the sand lines down through the soil layer. This is very helpful for drainage and root growth. Again, roots being found in the 3-4" range. #6 green looking okay for right now. I'm not saying this very loud. We still have a long road to hoe. Sample on #6 beginning to show some weakness from the left side middle. Core sample. 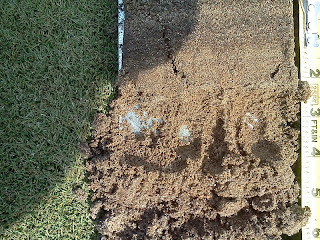 Notice the light colored aeration hole filled with sand. This is very important for better drainage and growing roots out the tighter sand topdressing layer. Roots at the 3-4" level with additional rooting coming out of the cored area. Moisture will penetrate the tee more quickly during rain events allowing the tee to become more playable in a shorter time and allow mowing to be completed. 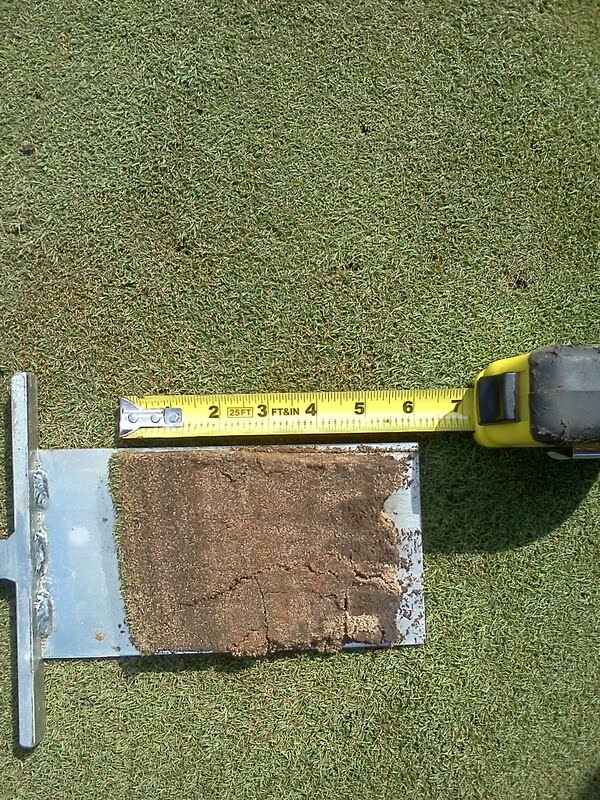 Moisture can move into the root zone more quickly allow for a healthier plant and less water applied. Small reservoirs are created by the aeration holes during rain events which help to move water off of the surface but then slowly moves into the root zone. 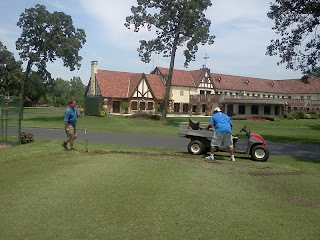 Thatch removal occurs as well. We will topdress in a few days which will help to fill the holes with sand which will improve overall drainage and firmness of the tee and smooths the surfaces. This will also assist a player in placing the tee into the ground due to the softer condition created by not only the aeration hole but the sand application. We will be doing a deep solid tine aeration in the next few weeks as well which will help us with deeper drainage, especially in the winter reducing crown damage from lack of water being able to move away from the crown of the plants. It will also make for better playing conditions for our winter golfers. Tom Lewis using our Verti-drain to pull the cores. The silver drag on the back helps pull a majority of the cores to the edge. 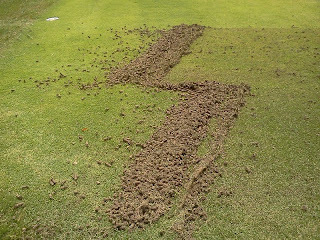 Pile of cores at the end of the tee ready for pick up. Skip and Russ picking up the pile of cores for disposal. 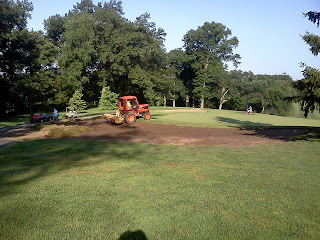 Jeff dragging the remaining cores on the tee to break them and help work the remaining soil into the canopy. Demarcus, Tom and Nick blowing the remnants of the cores off of the tee in preparation to be dry mowed today. Home lawns, what am I to do? I receive updates from both Missouri and Kansas State turf programs and extension. There was an interesting posting from Kansas State regarding irrigation of home lawns. Right now, if you have a cool season lawn, you should be doing nothing to the lawn except applying some water from time to time to keep it from going dormant. Heavy, saturated watering leads to more weeds outpacing your turf this time of year. Also, nutsedge is everywhere. Spraying during this type of heat might kill the water grass but will kill everything else. We have a fine crop on the golf course right now that will continue to grow until the weather cools to more normal or less than normal temperatures. I missed my window earlier in the season to eliminate some of this dastardly stuff and refuse to damage good turf just to reduce its existence. This season, it has won but there is always next year and we will be applying early and often before the heat. Our greens have faced some difficult conditions over the last couple of weeks with what appears to be more to come in regards to hot weather. We have gone two weeks without rain which good good during high heat because we can control the amount of water to our greens. However, our greens have become consistently inconsistent throughout the profile. There is plenty of moisture in the surface area but we are seeing less than adequate levels in the 3-4" area of the profile which makes for difficult management of our putting surfaces. As mentioned in last weeks post, we are using all tactics to help get us through this most stressful period. 11th green is definitely struggling with wet and dry issues. Normally one of our wettest greens, we have struggled to get its moisture where it needs to be. 7th green with some stress but holding its own. Our collars have taking a beating over the last week. The green surrounds are beginning to pull water from these areas and we have reduced inputs to the green so there is less availability from these areas. We have pounded them with water from our hoses but to no avail in some cases. Hopefully, some of the turf has just gone dormant and is still alive in the crowns and will rejuvenate during some more normal weather. Some areas that have taken the most beating have been the practice green, left side #16 and the front of #3. All trouble spots from the past. Our Zoysia/Bermuda tees are fantastic and some of our cool season tees are beginning their yearly struggle. Drought stress or inadequate water distribution, disease and conditions just too hot for cool season tees(mixtures of poa, bent, rye and bluegrass) are just some of the issues we are facing. Removal of a few trees, raising the teeing level and or modifying locations of these tees would be something that should take place in the near future. Less water, no regular fungicide applications and great summer conditions are more the reason to remove these type of tees from the property. 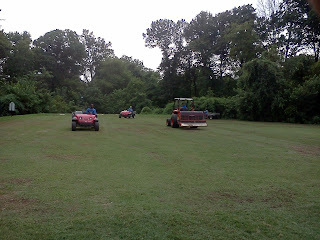 We have enough space for the zoysia to survive the amount of play that we have on a yearly basis. The first 20-30' of this tee is beautiful zoysia because it received enough sunlight to adequately grow a warm season grass. Our cool season fescue green surrounds are holding their own right now. They are stressed but doing okay. The back of 10 green surround is a great example of how our fescue program is working. You can see the line between the good fescue turf on the left side and the junk poa, bluegrass turf on the right. This will be replaced in the future to improve the overall look and playability of this area. Early heat in June has sent our warm season grass into hyper growth, including the dreaded bermuda. 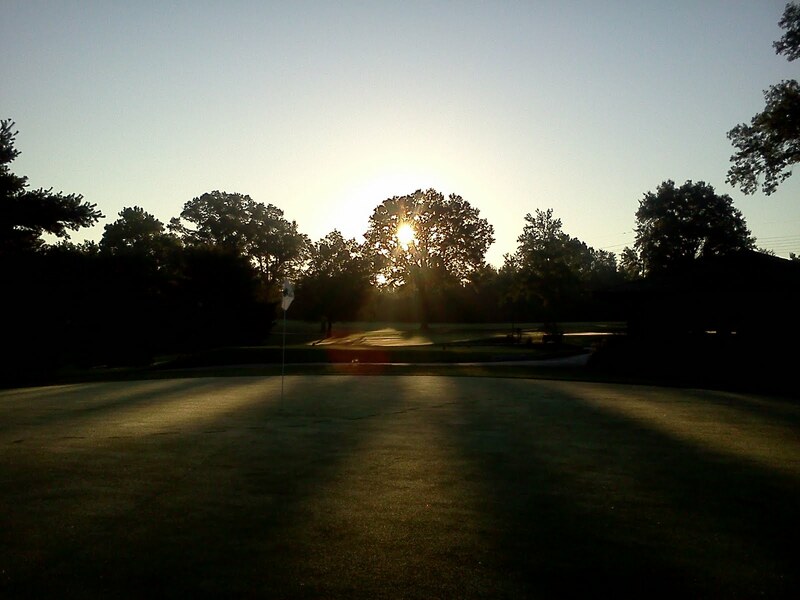 There are no safe control measures to use in the summer heat on our bentgrass collars and green surfaces. We will begin chemical treatments in September and will be seeding and replacing sod where possible. PLEASE DO NOT PULL THE RUNNERS. IT DOES NOT LOOK GOOD AND IT IS THE TURF WE HAVE AT THIS TIME. Thanks for your cooperation. 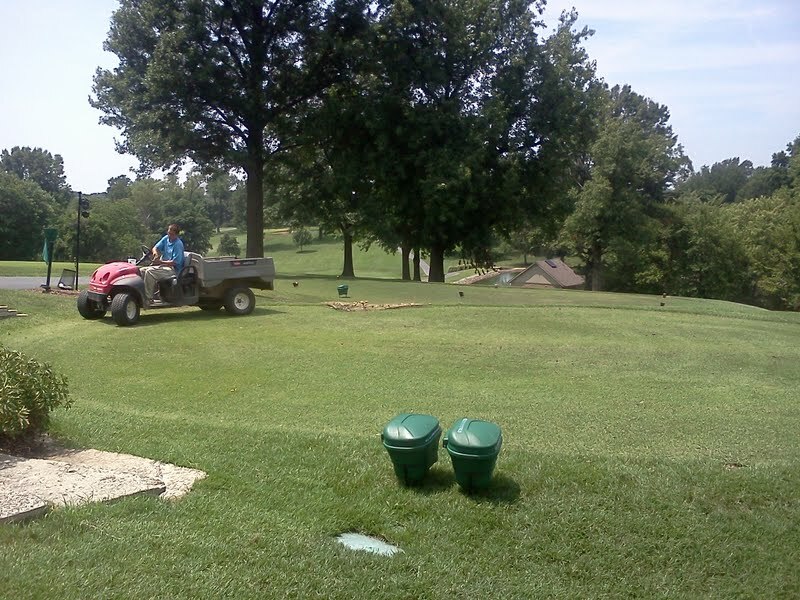 The long range tee has historically been a problem for the maintenance department. Lack of sunlight, size of the tee and other factors have led to various failures over the years. Currently, we have a fine bladed Bermuda Patriot, that is over seeded with rye grass in the fall and spring. 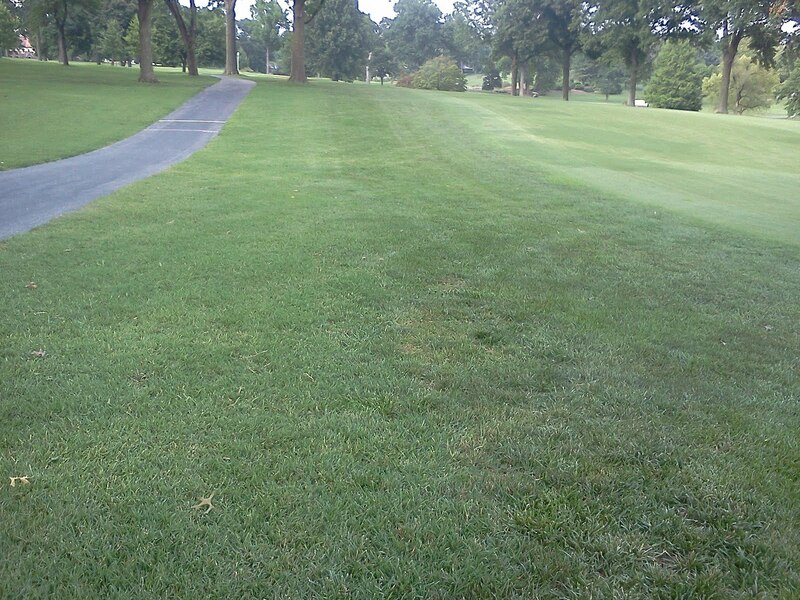 Since there is considerable shade issues with this tee, we end up getting less Bermuda in areas that ultimately turn to cool season poa/ryegrass which are very difficult to manage during the months of July/August in St. Louis. We also have some weed management issues, crabgrass/goose grass which crop up because of our need to seed the tee during the spring months to keep divots filled in with turf since the Bermuda is not able to cover the complete tee. Well, renovation time has come upon us again. We have some very good Bermuda areas with some spots in the middle that needed some Bermuda plugged back into the areas. We also have some severe turf loss along the edges of poa/ryegrass. We used our Verti-drain aerator today to pull cores and used the cores to fill in the spots that needed turf. Basically, we did a sprigged job in these weak areas. With some heavy watering and fertilization over the next few days, we should get some establishment in these areas. They should then fill in completely over the next few weeks as we push growth. We have some decent turfed areas in the front of the tee that we will use for practicing once the plugs have started to establish. Until then, we will have to be on the mats. I would expect by next week that the grass teeing area will be reopened when we area able to back off from our use of irrigation. The aeration we just completed will also be helpful for the rest of the season for the tee. Cores being pulled and staff spreading the cores over the bare areas. They also used a weed weasel to rough up the areas to make best soil contact. Staff driving over the cores to press them against the soil to make good contact with the existing ground and to smooth out the surface for future mowing. Final look after completion and soaking with water. 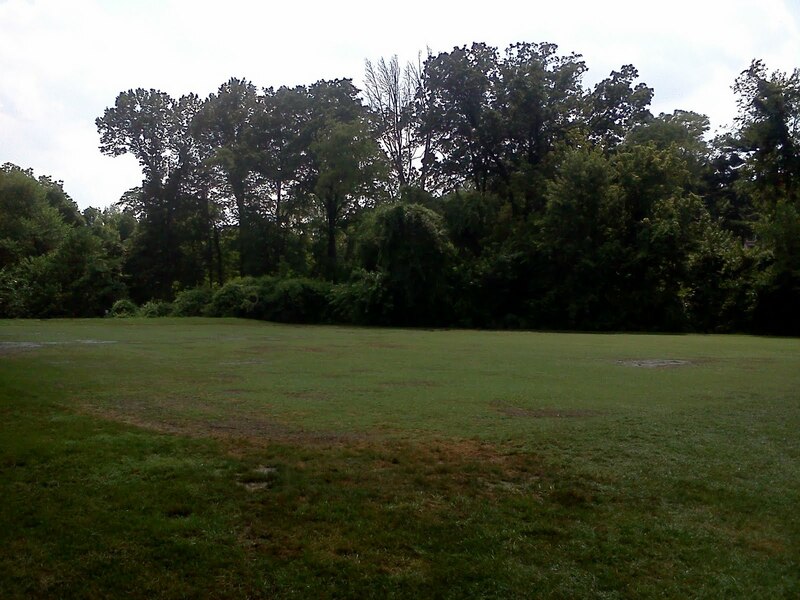 The front right foreground is in pretty decent shape even though there is some crabgrass contamination in the area. 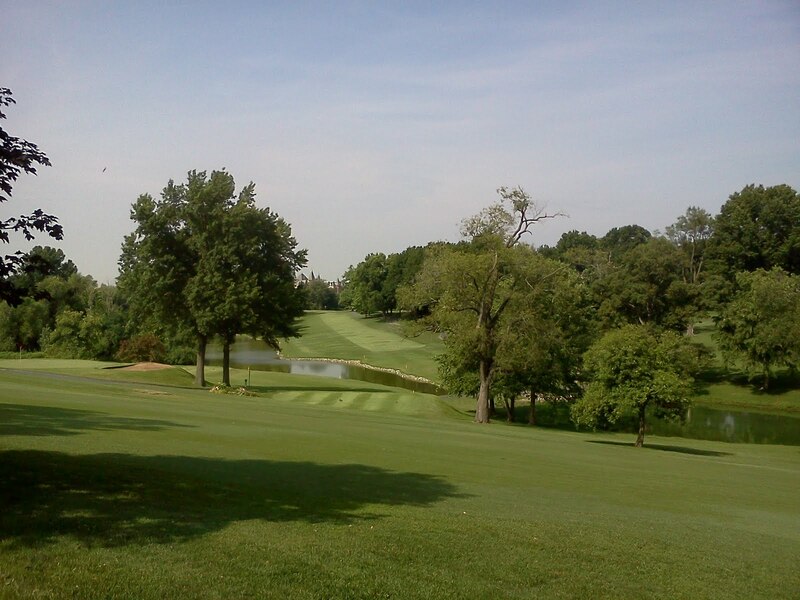 Last year's view of the tee before renovation. We were closed last year for 3-4 weeks. Green soil temperature is hot, Hot, HOT!!!! Our green soil temperatures are very hot right now. As you can see from my temperature gauge, it is pegged past 90. Once it is over 90, roots do not differentiate a few degrees. They are beginning to shut down, slough off and die. Microscopic root hairs which are where a majority of nutrients and moisture are taken up by the plant are completely shutting down and or not continuing to grow or function properly. Light cooling applications of water help reduce canopy temperature for short periods of time. Aeration holes like you see in the background allow air into the green soil system and allow moisture out to help reduce temperatures more quickly during cooler periods. 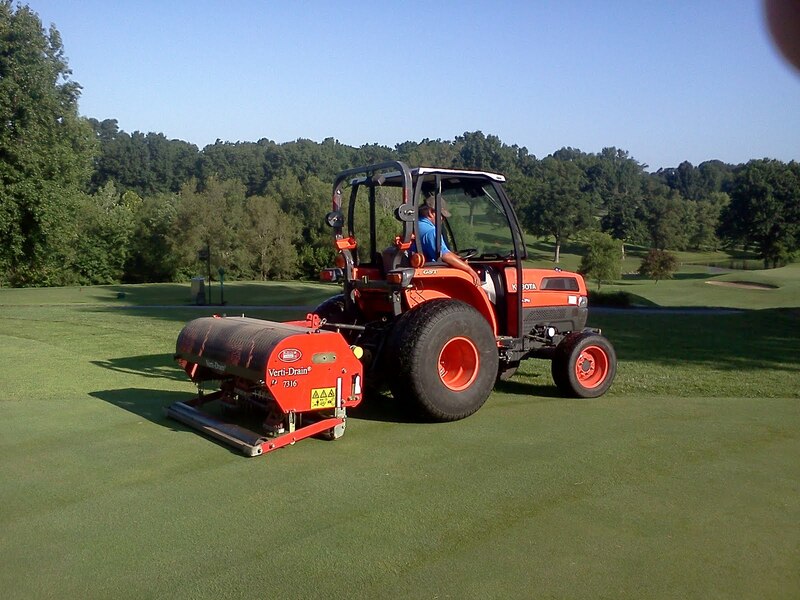 Reductions of inputs to the turf including mowing, increasing height of cut, rolling instead of mowing all help to reduce pressure on the plants during this extreme heat. Applications of sea weed extracts, growth hormones, humic acid, and light amounts of fertilizer assist the plant in handling stress. We have gone without rain now since July 12th but my preference for our greens would be to go another week or two before we receive any rain unless the temperatures begin to moderate. I can increase and decrease the water an needed but lose complete control of the situation when rain falls on the greens. Over the next couple of weeks, the expectation of quick greens will not be a goal that we will attempt to attain. The long range forecast for at least 15 days is for temperatures to be above 90 almost every day and upper 90's are being predicted later next week. If we reach 90 each day for the rest of July, we will be 9 days over the average for July and will have totaled 41 for the year so far which is 1 below the normal for the season with August(average 12.2) and September(average 4.5) still remaining. Cicada Killer Wasps have made their way back to Glen Echo over the last week. The Wasp is pictured above. They normally are harmless to humans but if they are aggravated they can sting. There is not a great deal we can do about these creatures but we do spray their burrows which they dig into our banks and or bunkers. We have seen them in areas such as the back right of #3 green, back right of #2 green, back of #17 green and other areas of the rough. They usually are here until September. Interesting note in the article that the adult killers usually use nectar as their food source, the dead cicadas are brought back to the hole(den) for the immature youths that are waiting for a meal. The small lake between # 10 lake and the main irrigation lake has developed a leak around the spillway. 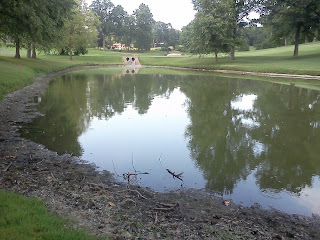 Dont worry, this area of the lake has leaked before and Skip and the boys have repaired it. The water level is almost down to the point of stopping. When the repairs are being made, I will make another post. On your next trip down 16 cart path, checkout the line of demarcation between the fescue rough next to the fairway and the bermuda rough which is closer to the cart path. There still is some bermuda in the fescue area but not like the solid bermuda area. We will continue to drill seed into these areas as well as chemically treat as the weather moderates in September. 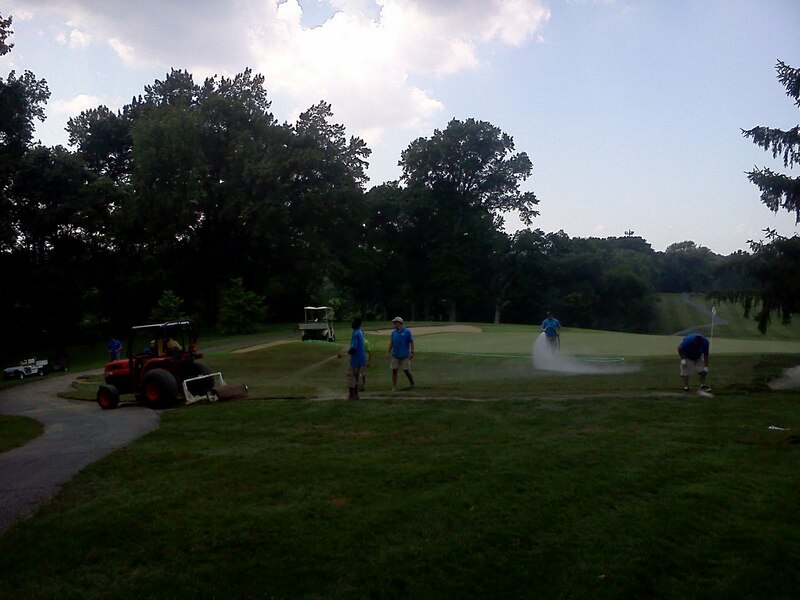 At least once each summer, we contract with Tom Edgerton of E&E Enterprises to Hydroject our greens. The hydroject is an aerator that uses a very highly pressurize bead of water to make a hole in the turf allowing for water and oxygen to exchange more freely in the green profile. This is a very non disruptive process to the putting surface and within a few days, you will not notice any holes in the surface of the greens. 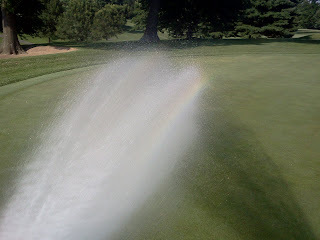 The bead of water can penetrate up to about 5" in depth and will give our greens a few weeks of relief from the heat. 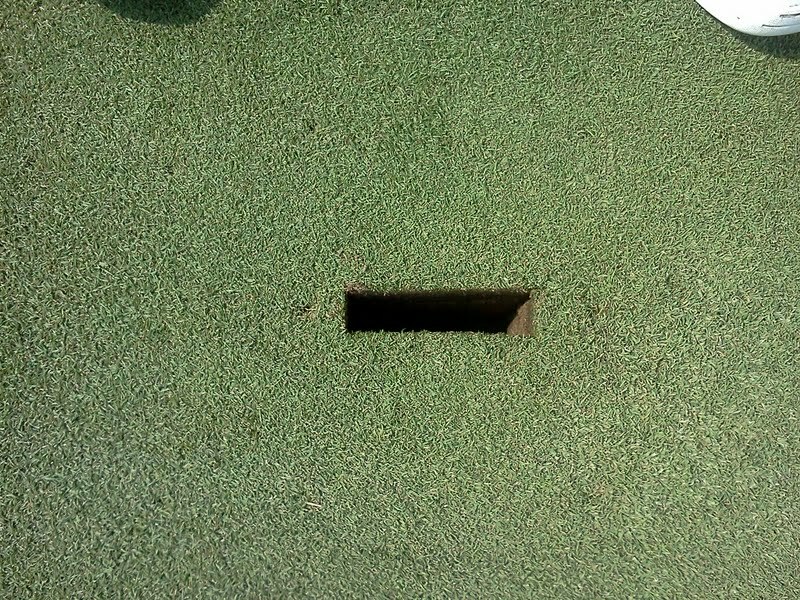 The hole pattern is about 2-3" spacing between holes. We had planned this process after the Invitational because of the usual stresses from a 3 day tournament of 120 people as well as the potential for some of the warmest and most humid weather of the year. Healthy root systems do not like highly saturated soils because they hold less oxygen and become very hot because of water's ability to conduct or hold onto heat. All of the greens were completed by 10:30 except for 17 which was finished by 11:00 a.m. Tom and his two sons each operated an aerator to help reduce the inconvenience to our members since the operation was performed on a open play day..
Stacey Edgerton, Tom's youngest son walking across the practice green with his aerator. The back of the machine and the hole pattern left by the aerator. As the summer moves into what is normally the hottest few weeks of the year, hopefully the steps we have taken over the first half of the season will assist our greens in surviving the summer heat. I have listed some additional steps below that we are implementing to protect our greens from the predicted weather of this week as well as the potential for high heat and humidity we will experience during the next few weeks. Raising height of the greens by .010 of an inch. Alternating between rolling greens one day and mowing greens the next day. 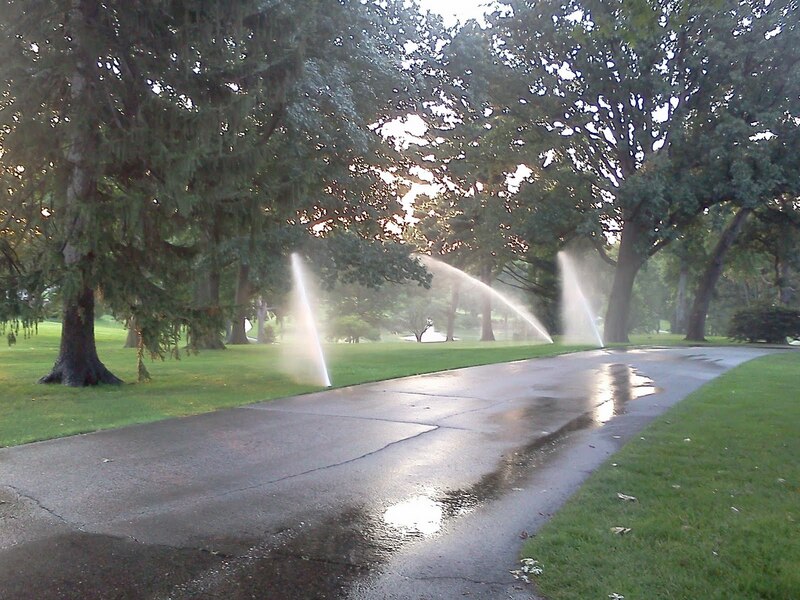 Hand watering regularly in the mornings and cooling the greens by syringing with the hoses in the afternoon. Hydrojecting greens on Wednesday, needle tineing approaches today. Will follow up with another needle tineing in a couple of weeks. Continue using growth regulators to help with controlling growth and reducing depletion of energy. Shorten spray windows with plant protectants and fertilizer/root stimulants. My original blog post regarding Kevin Corn's work at Rankin Jordan Hospital had an embedded video. Below is the link to the video. Skip is using our verti-drain aerator to poke some small 1/4" tines in our bent approaches. 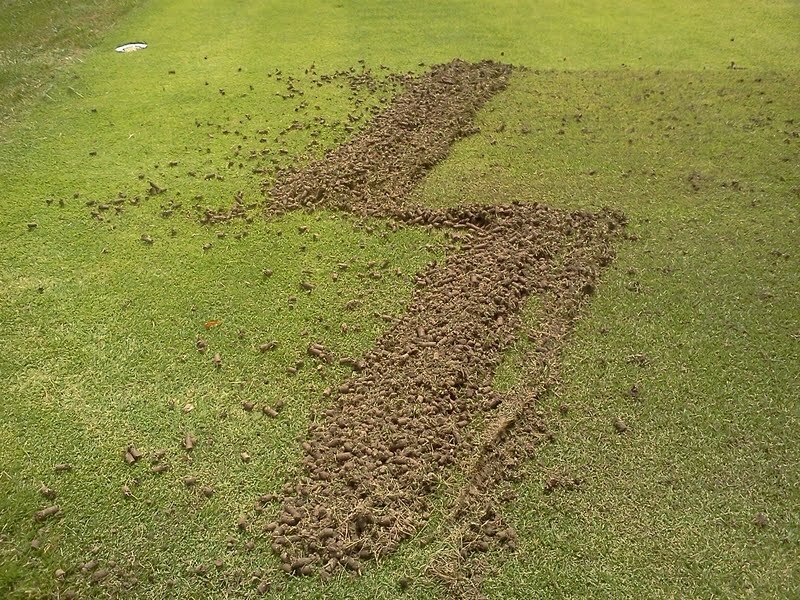 The holes are spaced in a very tight pattern to allow for maximum water penetration and oxygen into the soil with very minor surface disruption. Our greens will be vented tomorrow using the Hydroject aeration system. E&E Enterprises performs this service for us. They arrive and begin the process around 5:30 a.m.and will be complete by 10:00 a.m. We will roll the greens once they have been vented to smooth the surface for the days play. 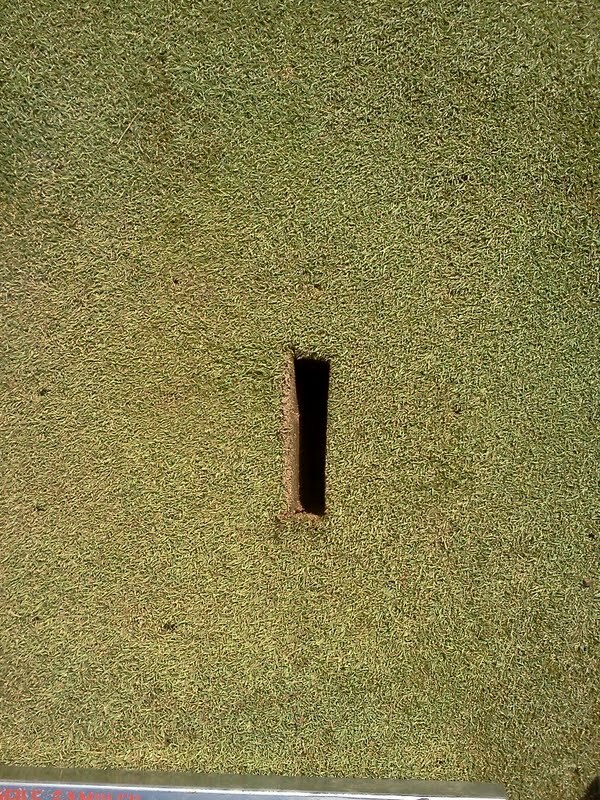 The holes should close very quickly and cause little disruption to the playing surface. It is important this time of year to open the green surface to allow them to dry and place more oxygen near the root system. Kudos to our PGA Golf Professional Kevin Corn on the work he is doing at Rankin Jordan Pediatric Children's Hospital here in St. Louis. Kevin set up a program that allows children to swing a golf club every Tuesday at the facility in Maryland Heights. What a great program for those who maybe would never have gotten a chance to do something like this. Great job Kevin. I had mentioned in an earlier green committee meeting in the spring that I intended to improve the back middle and right hand side of the green surround on #3. The area is sun filled almost all day long and is incredibly hot in the middle of the afternoon. The intermediate cut is beautiful zoysia which is at 1.25" and is like carpet. We decided to extend the zoysia back another 16' which places it to the bottom of the back right mound. 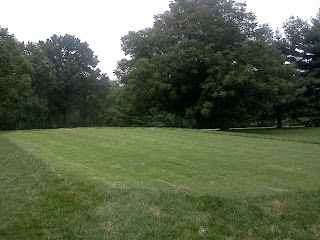 We then put another 16' of fescue which will be cut by the green surround mower at 2". Poa annua overwhelms the area each fall and we decided to remove it for good and replace the area with the sod. We had hoped to have this work completed sooner so it would be grown in completely for The Invitational but weather conditions would not cooperate this year allowing us to get everything accomplished . The work was started early Wednesday morning and was completed and in place when the gully washing rain hit the club late that afternoon to no ill effects on the sod. This area was one of the worst looking areas of the course from mid- summer until fall. It will be much improved from both a playability and visual aspect. 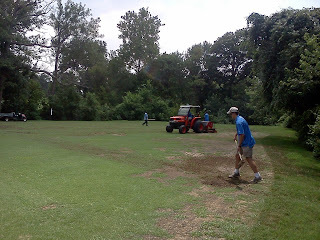 Jason cut the sod off with our walking sod cutter. Skip is using the box blade to push the material into the bucket and it is then placed in our single axle dump truck. A better view of the area. 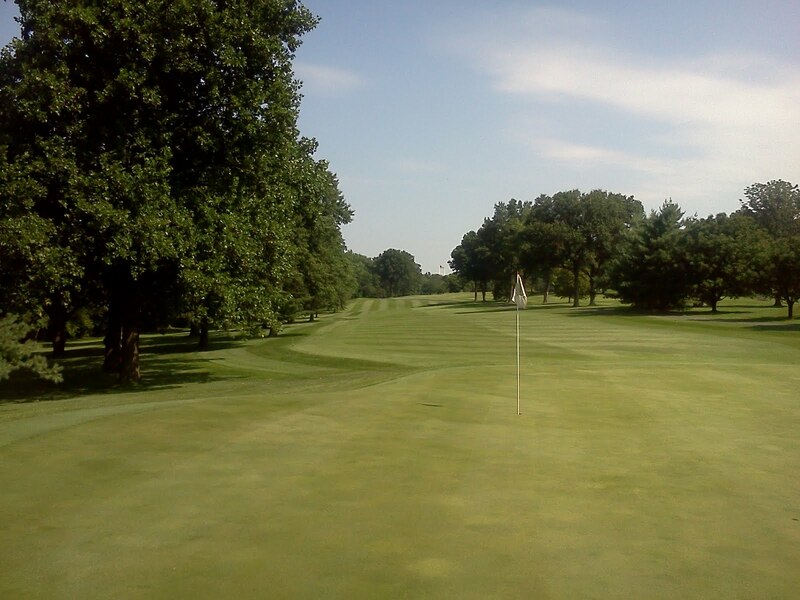 #3 green is in the back ground. 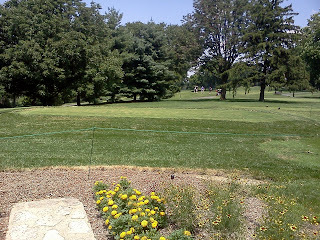 I am standing near the blue tee of #12. The staff finishing up the fescue being laid. Jason is hand watering the zoysia that was put down in the morning. The big roll sod provides for a much quicker application and I believe it heals in much quicker than normal sod pieces. Water, life blood of the course. Every morning when opening the front gate, a sigh of relief comes over me when I see there is wet pavememt meaning the automatic irrigation system has completed its task for the evening. To my dismay this morning, the road was dry. Pump system had a fault and shut down at the beginning of its cycle. Will investigate further today with our local pump rep. Playing catch up this morning and watering what we can. 99 degrees, wind and lower humidity have Asst Skip and Ia here late tbis evening. Greens holding up well. Picture is the stream of water from the showering nozzle we use to cool the greens and to apply heavier amounts where needed. With Old Glory in the far background, Hole # 2 looking spectacular after the fairway cross cut. The excitement is sure building for me regarding the upcoming week. The Invitational marks the half way point in the golf season. Not only are preparations being made for our premier event but also to take the facility through the second half of our golf season. Some extra painting and sprucing takes place along with trying to make our conditions the best possible at the same time taking into consideration that we still have half a season of golf remaining. Continuous rain over the last month has not given us a great deal of low humidity and dry conditions to get extended ball roll on our greens. Rolling and topdressing does help improve the overall speed but soft greens with grass full of water does not provide for the fastest conditions. We've been able to topdress the last two Mondays which will help with the smoothness. The wind and heat over the weekend began to dry to green surfaces between and Saturday and Sunday. As I was handwatering our greens in the afternoon, I could feel a marked difference in firmness from Saturday to Sunday. Handwatering allows us to put water where it needs to be applied instead of watering the whole green when it is not needed. We will begin rolling again on Tuesday which will assist in bringing the speed up to where we expect through the tournament. Hot temperatures over the next couple of days will begin to slow the growth of the greens as well. End of the weekend temperatures appear to be very hot as well with heat stretching into next week. Attempting to strike a balance between our Invitational and the rest of the season is a delicate at best. In general if we can keep a major rain event away, I think we will have great conditions this week and will be able to successfully manage the rest of the season. We will be making a bump up in our overall height of cut after the Invitational until the weather breaks in August to give our turf just enough added length to allow it to conserve energy through this most difficult period. 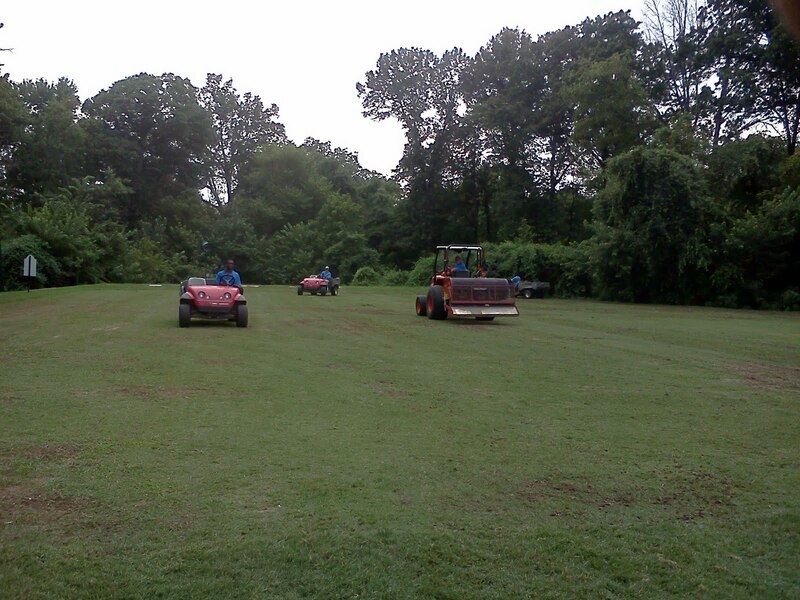 Alternating between rolling and mowing during the week will also give our turf a break. 2nd mowing of the new tees at 13 & 4 were completed today. 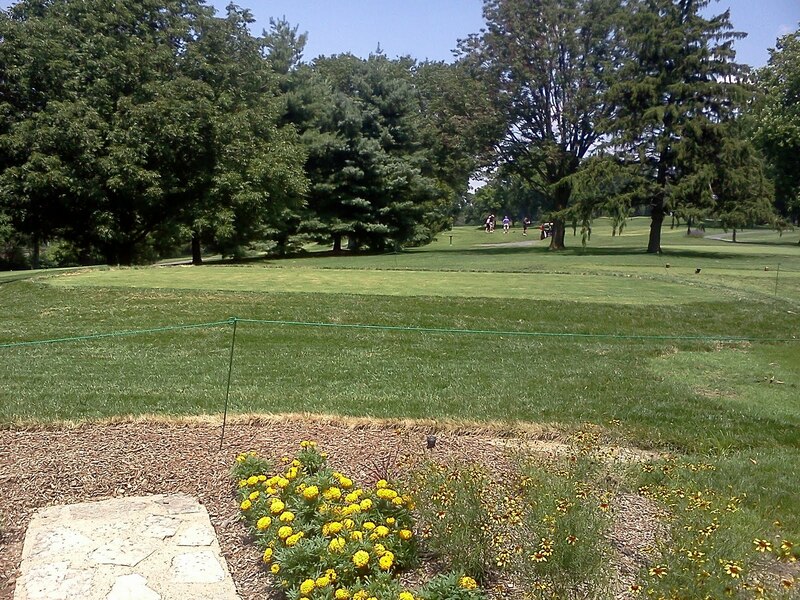 Cool season surround was mowed for the first time. Still intend to use for Invitational. Staff has had its work cut out for it this week as we've worked through 5.5 inches of rain. Looks like today will be a perfect summer day at Glen Echo. Well, same song and dance, a different day. The water supply pipe for the field bar, pro shop and maintenance building is delivered through an old pipe and begins its long journey to us from Lucas & Hunt road. That is why at times you see a Missouri/American water truck out near the field bar, they are reading the meter for that water supply. Yesterday morning one of our staff members noticed a concentration of water above #1 tee and along the cart path leading to the tee. We did some searching and found the water line that leads from the pro shop to our building had sprouted another leak. Skip began the chore of hand digging a hole about 4' deep and found the pipe but had to bring in the big machine to dig a bigger hole so we could repair it. I think we have had at least 6 repairs at various locations on the pipe since I've been here and Skip has lost count in the 28 years he has been here of all the repairs he has made. Oh well, just something else to take us away from Invitational preparations. Water off for about 3 hours yesterday. All repaired and hole filled back in today. Back to those preparations and or regular work. Skip brought out the backhoe for the big dig and Tom doing the small hand digging around the pipe. The old leaky pipe strikes again. Pipe cut and read for repair. First mowimg of the new tees with a walk mower. Need some dry days for it to firm. The tee is still progressing along nicely. 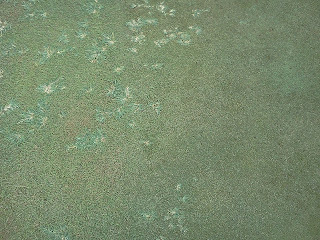 Blue green algae developed on our greens over the last couple of days. 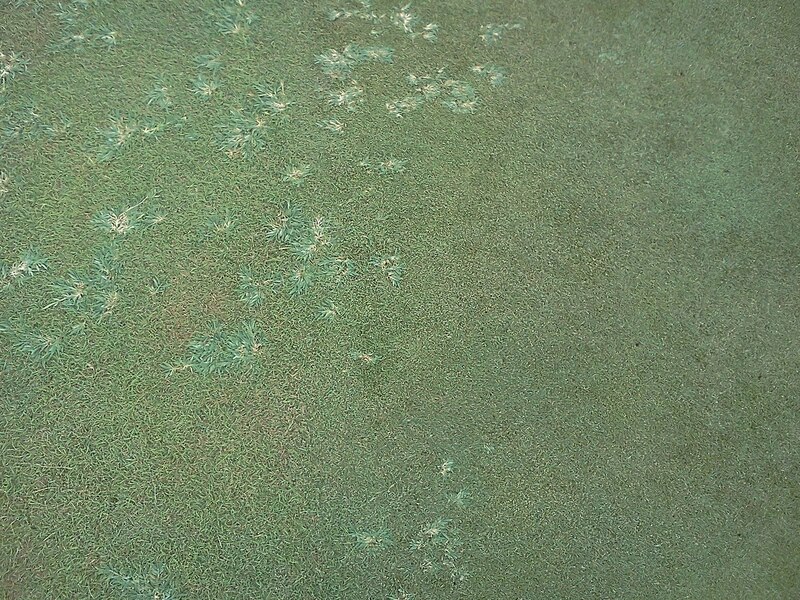 Most of this occurrance was along the edges but did come out onto the main greens surfaces after the heavy rains on Sunday/Monday and warm temperatures. We were at the end of a normal spray cycle on our greens along with the combination of high environmental pressure which caused the outbreak. We sprayed yesterday for our normal greens application and did a light topdressing which will help alleviate some of the symptoms. 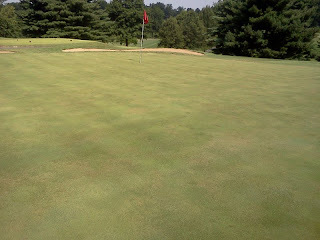 As the greens begin to dry, the algae becomes less prevalent. We plan to have the greens hydro-jetted after the Invitational which is a machine that vents the top of the green to a depth of 3-4" with a water jet at about 3000psi. Great machine and a very non-disruptive practice that will assist our greens in drying on the surface more quickly. This algae also can become prevalent where mowers scalp turf dies which opens up the surface for the algae to move into that area. Allowed to go unchecked, the algae can weaken the plants. For the most part, the algae is more of a cosmetic problem for us than a permanent issue. Blue-green algae on the edge of the putting green. 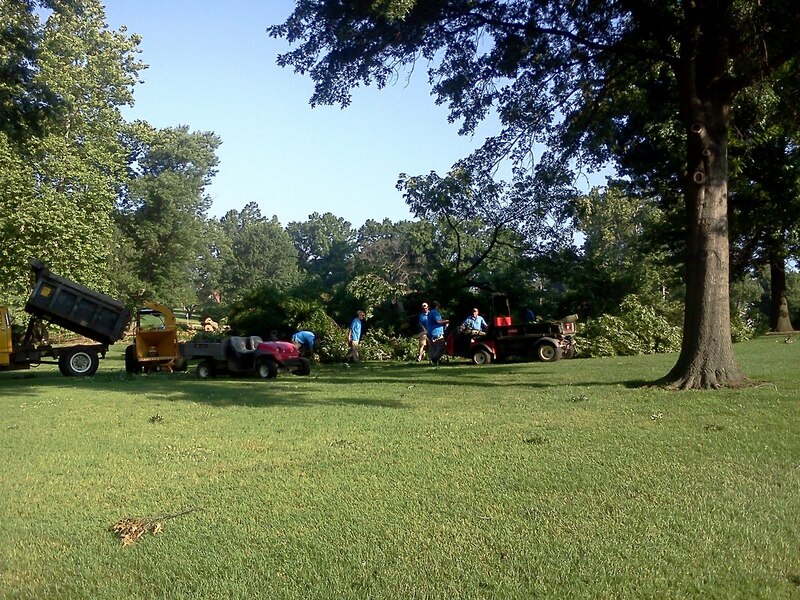 The crew worked yesterday morning to remove and grind the tops off of the two large trees that blew over on #9 lake dam. We still have to cut up the main part of the trunks but waiting for it to dry for another day so we can use the loader to haul them out. Once those duties were completed, two carts hauled in branches all day that were all over the golf course. We began blowing off fairways yesterday morning of twigs and leaves and then started mowing yesterday afternoon. Baled(mowed) the rest of the fairways this morning and will be cutting them again once the blower has blown off the excess clippings that accumulated after not being able to mow for 5 days. Began pushing bunkers yesterday, completing the task today and they will be raked. Rough mower, tee mower, intermediate mowers are all out today attempting to catch up from the mowing that we were not able to do on Monday and yesterday. Stump grinder was here for a few hours and ground out a few stumps we needed removed. 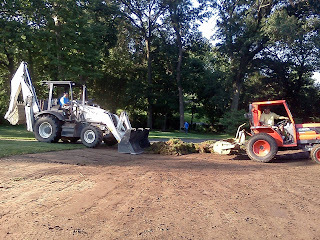 Material will be hauled away and sod replaced where needed. The staff working on cutting the top off of the second tree yesterday morning. View of the first tree after it was topped. 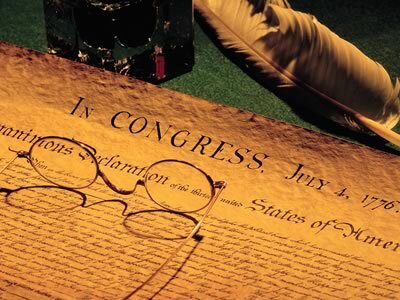 Happy 4th of July to everyone. Hope you've had an opportunity to relax and enjoy your club this weekend. Storms have put a little damper on things but still plenty of time to enjoy the day and it's meaning.